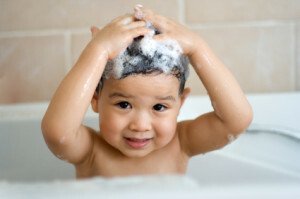 Formaldehyde and formaldehyde-releasing preservatives (FRPs) are used in many personal care products, particularly in shampoos and liquid baby soaps. These chemicals, which help prevent microbes from growing in water-based products, can be absorbed through the skin and have been linked to cancer and allergic skin reactions. FOUND IN: Nail polish, nail glue, eyelash glue, hair gel, hair-smoothing products, baby shampoo, body soap, body wash, color cosmetics. WHAT IS FORMALDEHYDE? Formaldehyde is a colorless, strong-smelling gas used in a wide range of industries and products including building materials, walls, cabinets furniture and personal care products. These preservatives release small amounts of formaldehyde over time.Since low levels of formaldehyde can cause health concerns—at levels as low as 250 parts per million and even lower levels in sensitized individuals—the slow release of small amounts of formaldehyde are cause for concern. A 2015 study determined that longer storage time and higher temperature increase the amount of formaldehyde released from FRPs and could ultimately lead to more severe health concerns. Quaternium-15 is the most sensitizing of these FRPs and is found in blush, mascara, lotion and shampoo. DMDM Hydantoin is found in lotion, sunscreen and make-up remover and is one of the least sensitizing of the FRPs. Sodium hydroxymethylglycinate is found in shampoo, moisturizer, conditioner, and lotion. Animal studies have shown that sodium hydroxymethylglycinate has the potential for sensitization and dermatitis. Bromopol is found in nail polish, makeup remover, moisturizer and body wash. Bromopol is considered safe in concentrations less than 0.1%, but cannot be found in formulations with the FRP amine. Mixing bromopol and amines produce nitrosamines (Link to same chemical in nitrosamines) which have been found to penetrate the skin and cause cancer. Glyoxal is found in conditioner, lotion, nail polish and nail treatment. CIR Expert Panel has declared that glyoxal is a skin allergen. Cancer: Formaldehyde is considered a known human carcinogen by many expert and government bodies, including the United States National Toxicology Program  and the International Agency for Research on Cancer. A 2009 review of the literature on occupational exposures and formaldehyde shows a link between formaldehyde and leukemia. A 2014 study found that formaldehyde initiates and promotes tumor formation. When formaldehyde is present in personal care products, people can be exposed by inhaling the formaldehyde that is off-gassed from the product, by ingesting it or by absorbing it through the skin. Most studies of the cancer potency of formaldehyde have focused on risks from inhaling it; cancer risks from ingesting formaldehyde or absorbing it through the skin are not as well studied. Animal studies indicate that formaldehyde can be absorbed through the skin when formaldehyde-containing personal care products, including formaldehyde-releasing preservatives, are applied. The formaldehyde released from FRPs has been linked to cancer, but there is little evidence that FRPs directly cause cancer. However, a mixture of the FRP bromopol and amines, which form nitrosamines, has been found to penetrate skin and cause cancer. Irritation: Formaldehyde is the 2015 American Contact Dermatitis Society Contact Allergen of the Year. At high concentrations formaldehyde can cause chemical burns, however, this is mostly an occupational hazard. Formaldehyde in cosmetics is widely understood to cause allergic skin reactions and rashes in some people. Although concentrations of formaldehyde in personal care products are generally low, everyday products can contain enough formaldehyde to trigger a reaction in people with formaldehyde sensitivities. A 2015 study determined that up to 11.9% of the population is allergic to formaldehyde when exposed to a 2.0% formaldehyde patch test. Formaldehyde sensitivity may develop over time from repeated low-level exposures. Most irritation from FRPs is in response to formaldehyde being released; however some of the FRPs can trigger a reaction on their own. Quanternium-15 is the most sensitizing of the FRPs. A retrospective study by the North American Contact Dermatitis Group (NACDG) revealed an increase in the incidence of allergic reactions to Quaternium-15 over time. Patch tests of Quaternium-15 revealed that about 22.3% of consumers are allergic to Quaternium-15. Glyoxal and sodium hydroxymethylglycinate are known skin allergen. Animal studies have shown that sodium hydroxymethylglycinate may cause sensitization and dermatitis. Irritation has gone away when products containing sodium hydroxymethylglycinate are avoided. VULNERABLE POPULATIONS: Infants, hair salon workers, nail salon workers. REGULATIONS: Banned from use in cosmetics and toiletries in Japan and Sweden; in the EU, restricted in personal care products, and labeling is required in products that do contain these chemicals; concentration restrictions in Canada. The EU allows the use of Quaternium-15 up to 0.2% as a preservative in cosmetic products. HOW TO AVOID: Read labels and avoid products containing the following ingredients: Formaldehyde, quaternium-15, dimethyl-dimethyl (DMDM) hydantoin, imidazolidinyl urea, diazolidinyl urea, sodium hydroxymethylglycinate, 2-bromo-2-nitropropane-1,3-diol (bromopol). In addition, choose nail products that are labeled formaldehyde-free or “toxic-trio-free” (formaldehyde, toluene and DBP). Skip hair-smoothing products—especially those sold in salons, as salon-based products are exempt from labeling laws. Don’t use expired cosmetic products or store cosmetic products in the sun because this can cause more formaldehyde to be released. Scientific Committee on Cosmetic Products and Non-food Products. Opinion concerning a clarification on the formaldehyde and para-formaldehyde entry in Directive 76/768/EEC on cosmetic products. Opinion: European Commission. 2002. Available Online: http://ec.europa.eu/food/fs/sccp/out187_en.pdf. Accessed Online October 16, 2009. Moennich JN, Hanna DM, Jacob SE (2009). Environmental Exposures-A pediatric perspective on allergic contact dermatitis. Skin & Aging. July 2009:28-36. Jacob SE, Breithaupt A (2009). Environmental Exposures-A pediatric perspective in baby and cosmetic products. Journal of the Dermatology Nurses’ Association 1:211-214. Flyvholm MA, Hall BM, Agner T, Tiedemann E, Greenhill P, Vanderveken W, Freeberg FE, Menne T. Threshold for occluded formaldehyde patch test in formaldehyde-sensitive patients. Relationship to repeated open application test with a product containing formaldehyde releaser. Contact Dermatitis. 1997;36(1):26-33. Jordan WP Jr., Sherman WT, King SE. (2009). Threshold responses in formaldehyde-sensitive subjects. J Am Acad Dermatol. 1979;1(1):44-48. Also confirmed by personal communication between Dr. Sharon Jacob and Stacy Malkan, February 26, 2009. Propionate, A., Chloride, B., Urea, D., Black, D., Hydantoin, D. M. D. M., Acetate, E., … & Glycerides, H. T. (2008). Annual Review of Cosmetic Ingredient Safety Assessments. International Journal of Toxicology, 27(1), 77-142. Imidazolidinyl Urea Available Online: http://www.ewg.org/skindeep/ingredient/703119/IMIDAZOLIDINYL_UREA_%28FORMALDEHYDE_RELEASER%29/. Accessed September 19, 2015. Imidazolidinyl urea Available Online: https://ntp.niehs.nih.gov/ntp/htdocs/chem_background/exsumpdf/imidazolidinylurea_508.pdf. Accessed September 28, 2015. Diazolidinyl Urea Available Online: http://www.ewg.org/skindeep/ingredient/701923/DIAZOLIDINYL_UREA_%28FORMALDEHYDE_RELEASER%29/#. Accessed September 19, 2015. Polyoxymethylene Available Online: http://www.ewg.org/skindeep/ingredient/705083/POLYOXYMETHYLENE_UREA_%28FORMALDEHYDE_RELEASER%29/. Accessed September 19, 2015. Russell, K., & Jacob, S. E. (2010). Sodium hydroxymethylglycinate. Dermatitis, 21(2), 109-110. Nitrosamines available online: http://www.cosmeticsinfo.org/nitrosamines. Accessed September 23, 2015. Andersen, F. A. (2000). Amended final report on the safety assessment of Glyoxal. International journal of toxicology, 19, 13-27.
 International Agency for Research on Cancer. “IARC classifies formaldehyde as carcinogenic to humans.” Press release. June 15, 2004. www.iarc.fr/en/MEdia-Centre/IARC-Press-Releases/Archives-2006-2004/2004/IARC-classifies-formaldehyde-as-carcinogenic-to-humans. Accessed January 9, 2009. Zhang et al 2009. Meta-analysis of formaldehyde and hematologic cancers in humans. Mutation Research 681: 150-168. Yoshida, I., & Ibuki, Y. (2014). Formaldehyde-induced histone H3 phosphorylation via JNK and the expression of proto-oncogenes. Mutation Research/Fundamental and Molecular Mechanisms of Mutagenesis, 770, 9-18. Australian Government Department of Health and Ageing. Priority Existing Chemical Assessment Report No. 28: Formaldehyde. November 2006. Page 68. Available Online: http://www.nicnas.gov.au/Publications/CAR/PEC/PEC28/PEC_28_Full_Report_PDF.pdf. Accessed January 9, 2009. Bartnik FG, Gloxhuber C, Zimmerman V. (1985). Percutaneous absorption of formaldehyde in rats. Toxicol Lett, 25(2):167-172. Pontén, A., & Bruze, M. (2015). Formaldehyde. Dermatitis, 26(1), 3-6. Flyvholm MA, Menne T. (1992). Allergic contact dermatitis from formaldehyde. A case syudy focusing on sources of formaldehyde exposure. Contact Dermatitis, 27(1):27-36. Boyvat A, Akyol A, Gurgey E (2005). Contact sensitivity to preservatives in Turkey. Contact Dermatitis, 52(6):333-337. Pratt MD, Belsito DV, DeLeo VA, Fowler JF Jr, Fransway AF, Maibach HI, Marks JG, Mathias CG, Rietschel RL, Sasseville D, Sheretz EF, Storss FJ, Taylor JS, Zug K. (2004). North American Contact Dermatitis Group patch-test results, 2001-2002 study period. Dermatitis, 27(1):27-36. Australian Government Department of Health and Ageing. Priority Existing Chemical Assessment Report No. 28:Formadehyde. November 2006. Page 193. Available online: http://www.nicnas.gov.au/Publications/CAR/PEC/PEC28/PEC_28_Full_Report_PDF.pdf. Accessed January 9, 2009. Jacob SE and Steele T (2007). Avoid Formaldehyde Allergic Reactions in Children. Pediatric Annals, 36(1):55-56. Other uses of formaldehyde have different restrictions in Canada. Canada’s Cosmetic Ingredient Hotlist Available Online: www.hc-sc.gc.ca/cps-spc/person/cosmet/info-ind-prof/_hot-list-critique/hotlist-liste_1-eng.php. Accessed October 16, 2009. Amparo S and Chisvert A (2007). Analysis of Cosmetic Products. Elsevier. Amsterdam, p. 215.